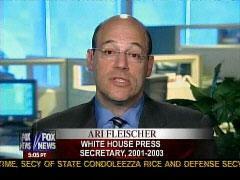 Former Bush press secretary Ari Fleischer, who endured a lot of pointed Helen Thomas questions, told Sam Stein of The Huffington Post that Hearst Newspapers should dismiss Thomas for saying Jews need to "get the hell out of Palestine" and go back to Poland and Germany. Thomas would apologize in a written statement, saying she deeply regretted the comments -- which were offered in response to the killing of pro-Palestinian activists by Israel forces and came, ironically, during the White House's Jewish Heritage Celebration. In a 2004 speech to the Al-Hewar Center near Washington, D.C., a few days before the third anniversary of the Sept. 11, 2001 terrorist attacks, Thomas, then 84, returned to her favorite obsessions: "Good evening, fellow terrorists .... or is it evil ones? I simply say so because I presume that most of you are against the invasion and the occupation of Iraq." At the center, which reportedly has hosted speakers reflecting the intolerant Wahhabi school of Islam, she also declared that "... It turns out (can you imagine?) that even Middle Easterners — Arabs — will fight for their own land. They are what we call the insurgents, or terrorists, or even the enemy. They’re the enemy in their own country, trying to defend their own land .... During World War II, those who resisted the Nazi occupation were heralded for their resistance against tyranny. But when Arabs do that, do they get that kind of salute? The Palestinians who resist every day the tyrannical occupation are in the same boat ...."